This article is valid for any games at land-based casinos (including poker) and would probably be applied to VR poker. 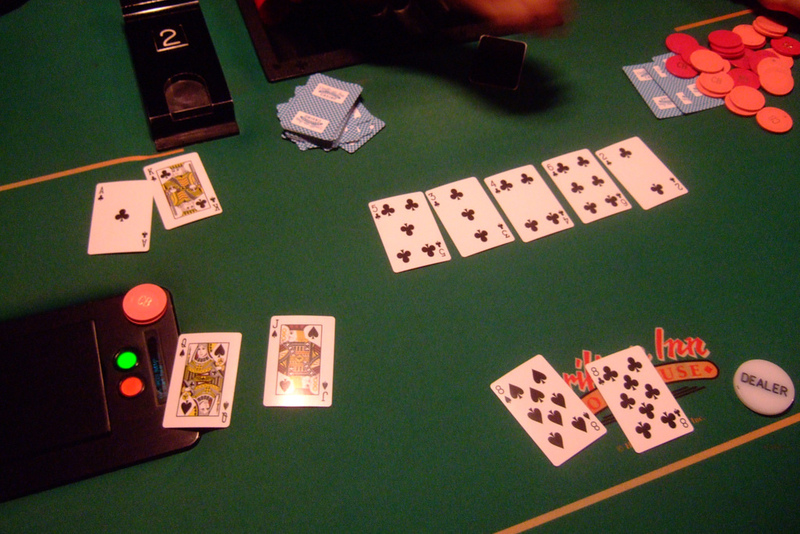 Players have many options of how to provoke dealer’s mistakes. Those tricks are relevant not just in blackjack but also in other games. The main ways have man’s psychology in them and it is difficult to master all the methods, though the most popular are known to all the players. One of the methods is to make friendly connection with dealer. First of all, give him compliments about his professional skills, if it is her – common compliments will work. Assess her looks or style of dealing cards and the dealer will soften You can make emphasis on mistakes being the part of the game as we’re just people and no one is safe from making them. Don’t mention casino game in particular, just say it in some other context. After these talks the dealer subconsciously won’t be afraid of making a mistake as you have “justified” him beforehand. This state may become the reason for him being inattentive and make him make mistake. The most important part here is not to believe in it yourself and not make your own mistakes. Do not forget to study the rules of the game before using this twist. You might start showing compassion towards the dealer. Tell him you’re sorry about the environment he has to work in. It is noise, cigarette smoke, tough shifts… all these factors and your empathy will justify his future mistakes. Praising dealer in front of the pit boss will relax the dealer to the maximum, as he will start working not in full focus. If pit boss makes comments on the croupier’s work, just support the dealer and take his side. This trick is effective when dealer is angry for his boss. When situation disallows you talking of conditions of his work and problems with the management, talk about his low salary. So talk of long shifts or switching jobs. Protect dealers and take their sides. During all the talks, say that casino treats professional dealers wrongly. Sometimes the conditions in the casino are good and the dealers will protect it. Anyway, don’t argue with the dealer and make everything to make him trust you. Sometimes the trick with putting yourself below the leader helps. Just ask him to not be too tough outplaying you (even if you’re lucky) and express the hope he will be good to you. Let the dealer have an impression he’s almighty and top-notch pro who’s outplaying the beginner. Being overconfident never has been good for anyone so keep croupier in this state. One of the major rules for the player is keep on general mass of the visitors. Setting relations and getting the dealer ready for future mistakes should not attract attention to your person. Don’t scream, don’t swear. If you lost, don’t swear too much, be preserved. Try to behave yourself as common players do. Be happy about you wins if it is pleasant to you. Try especially hard for dealer to not attract attention to your person. He shouldn’t announce the winning amount too loud or congratulate you with the big win. Use all the tricks to not attract additional attention and not get curious looks. Big chips help with that (as big piles of chips would attract attention of the players and thieves). You can also lower the interest to your person playing at the tables where the rest of the players bet more than you do. Dealer won’t be considering your box as important as more expensive ones. This attitude will allow you to increase the sizes of your bets if the count at the tables is good for you. If the dealer made a mistake on counting or paying to some other player and one of your neighbors told him that, you should switch the table. As in the future, this could happen to you. If the dealer corrected himself, stay. You may get lucky and don’t make the table switch too obvious by leaving right away. As a rule, the first mistake gets the dealer out of rhythm and he becomes nervous and starts to make mistakes. Sometimes simple psychological moves are able to help you to get to the winning situation and make even the experienced dealers make mistakes that favor you. And may be they will help you to win WSOP bracelet.